I squeezed every last drop of summery goodness out of the last day of the school holidays. That included a little lie in, a cooked breakfast and a crafty fabric-based morning as I worked on my paper piecing. Then I headed into London to meet the boyfriend for a drink before we went to see West Side Story at Sadler's Wells. It was stunning. The music, the amazing choreography, the fluid skill of the dancers and the drama and excitement made it a truly exceptional performance. The set and the lighting gave it so much atmosphere and the show managed to be both funny and moving. I LOVED it. Sorry for gushing, but it was SO GOOD and I felt like I couldn't take it all in at once. I think it was the dancing that really made it. It was absolutely perfect - energetic and tight and just brilliant and I have no idea how they had enough breath left to sing! We ended a lovely day with a pub dinner - chorizo burger = yum. P.S. This is how I'm going to do Shimelle's class Learn Something New Every Day this year. Bear with me: it's a bit tangential. But I'm learning to use my phone camera to its best advantage; to try to work with it instead of being frustrated by its limitations. Anyway, each day I hope to pick 2 or three of my Instagrams for the day and write a few sentences to accompany them. I may turn them into an album at the end of the month, I may not. I could equally well just turn selected highlights into pages. For now, I'm just going to see how it goes. Very envious you got to see West Side Story and glad it lived up to all the hype! Oh that show sounds amazing. I am always blown away by the talent in the west end. The singing and the dancing are always incredible. I am really enjoying following your instagram feed at the moment. Can't wait to see what september has in store! 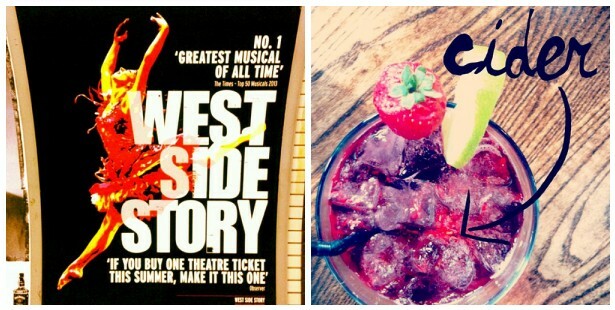 Great instagram photography :) That musical is heading Manchester way soon - you have me sorely tempted now! PS Thank you for the Millionaire's Shortbread recipe link. Sadly we don't own a microwave (long story cut short - dd blew it up and we never replaced it!) It turned out OK though with an M&S book recipe.